Whenever I come in contact with the Indian barnyard millet, also known as varai, samo, bhagar or “vrat ke chawal” I’m reminded of the story that our family friend Dr. Anil Paranjpe related to us a few years ago. An ophthalmologist by profession, he conducts eye camps in the poverty and drought ridden interiors of Maharashtra. 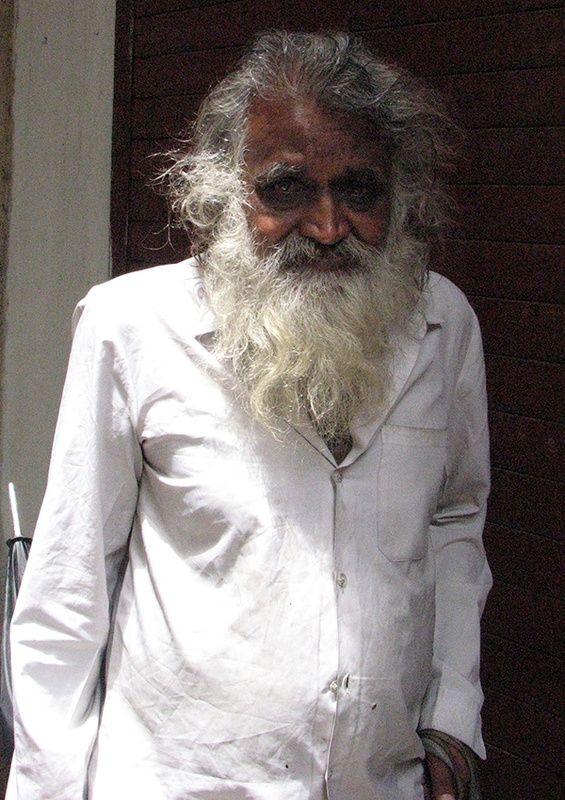 One day, after lunch at our place, he told us about how during one such philanthropic expedition where they treated villagers, he and his son were moved by the sight of a poor old lady coyly opening her lunch box and eating plain cooked “vari chi tandul (plain barnyard millet cooked with water and salt)”. With no vegetables, dals or other preparations to accompany the meal, this provided her with sole sustenance. In the dry arid interiors of the Indian state of Maharashtra and other places, where its difficult to grow vegetables and other crops “millets” which grow easily in dry zones, form a major part of their diet. But, are millets meant only for these poor old farmers? And how do they sustain themselves with only “millets” forming a major chunk of their diet? Belonging to the genus, “echinochloa”, millets are tiny seeded grasses that grow with the least human intervention in comparison to other grains like rice or wheat. They are also known to be inherently bio-diverse and farmers usually grow millets in combination with other pulses, legumes, vegetables and oil seeds. I came across a literature from the first “national convention of millet farmers” that was held in Dharwad, where farmers from eight Indian states came together in 2011 to discuss the revival of this forgotten food and the challenges in preserving the natural seeds that evolved under specific agro climatic conditions without succumbing to the pressures of using hybrids and GM varieties. In India cereals, grains and beans are not consumed during specific fasts, like the “Ekadashi” or during the Navratras. Barnyard millet steps in as a suitable alternative to rice since its technically a seed. What did not appeal to me about Varai is that it turned sticky and soggy once cooked and I rarely cooked it during the days of fasting. However, on one Ekadashi day I remembered the “Varai Pulao” that my father’s sister, my aunt Prabha had made which was not a soggy mess. And I had the fortune of referring to my 15 year old recipe book where I had scribbled the recipe promptly in one of the pages. A little improvisation and I was well on my way to a spectacular pulao with separate grains and may I repeat it again “no soggy mess”. I often cook this on Ekadashi days and serve it up with a baby potato curry and a cooling raita. 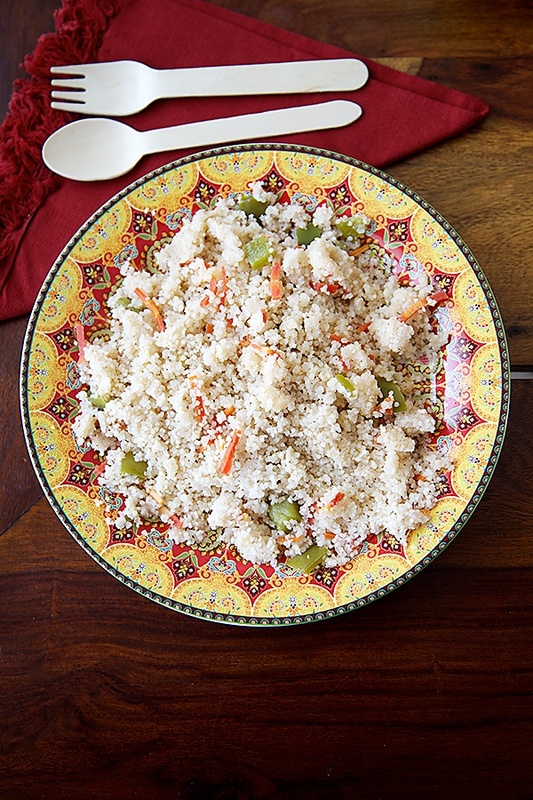 For those looking for a variation or alternative to their wheat and rice meals, this can make a great weekday or weekend lunch or dinner meal. And the highlight of making this is always the moment when the lid is opened and the aroma of the spices wafts through the air giving the utter comfort of a great home cooked meal! 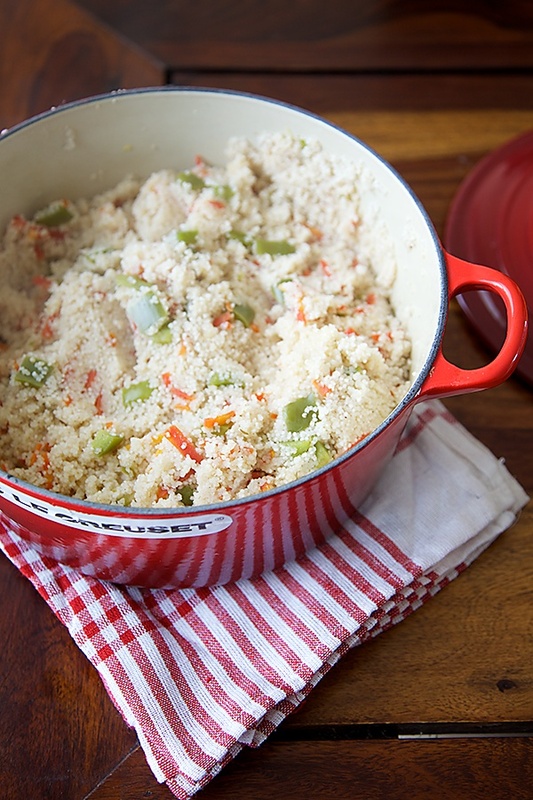 You can also use vegetables like cauliflower here. Dry roast the millets on a low flame until they acquire a nutty flavour, about 8 to 10 minutes, while ensuring that they do not turn brown. 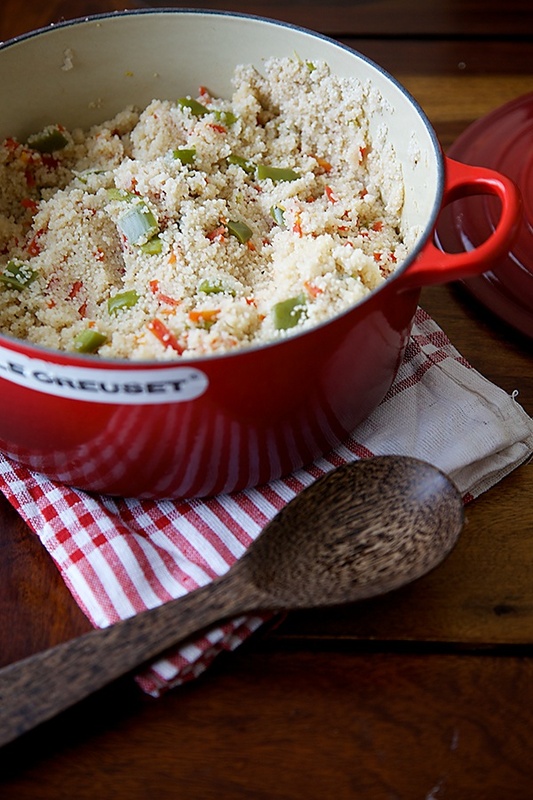 This step is crucial to get cooked millets which are fluffy and do not stick to each other. Prepare the vegetables and keep aside. In a small iron skillet, put int he whole spices and roast until aromatic, about 3 to 4 minutes. 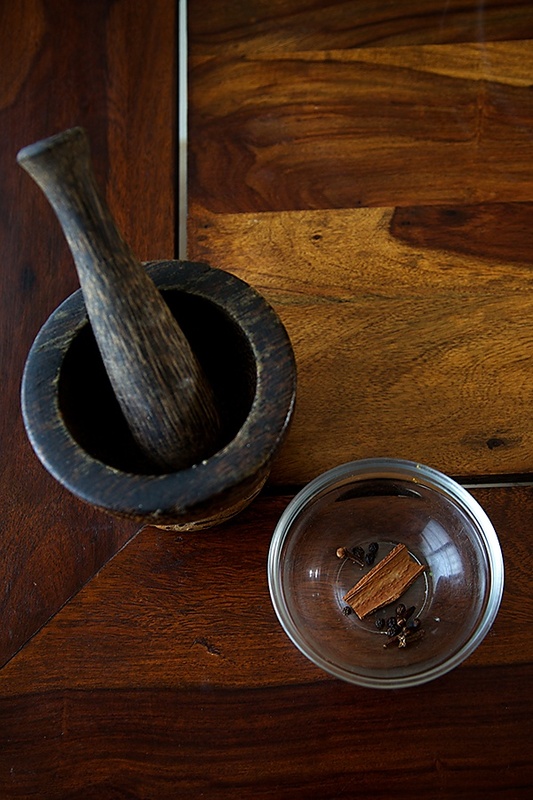 Powder these spices with a mortar and pestle or a coffee grinder. 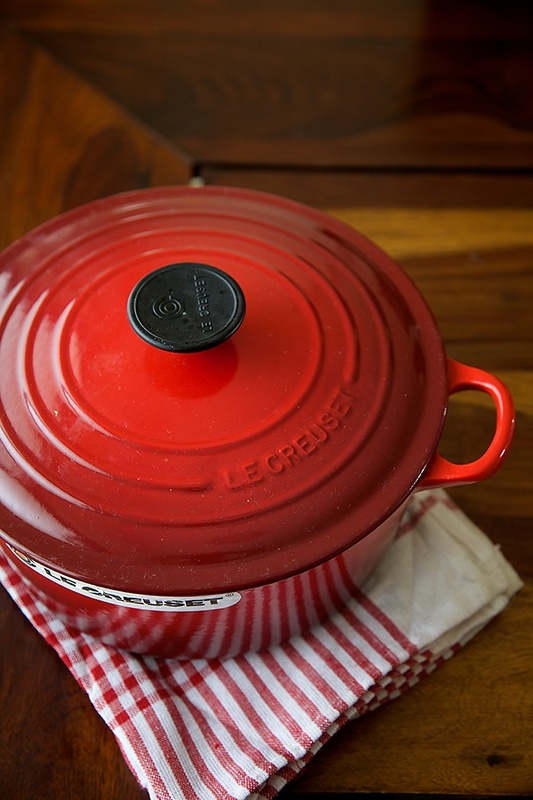 In a large pan or a cocotte, put in the ghee or vegetable oil and heat over a medium flame until the ghee melts if using ghee or until the oil is hot but not smoking. Lower the heat and put in the ginger and chili, stir fry for a minute. Put in the vegetables and cook covered for about 3 to 4 minutes on low heat. Pour in the water over the vegetables and bring to a boil. Lower the heat. Stir in the powdered garam masala and salt. Wash the millets and and put them into the water, just as it comes to a boil. Cover and cook till done on the lowest heat possible, for about 15 to 20 minutes. After 15 minutes, if you find that the top layer is uncooked, then sprinkle 1/4 cup to 1/2 cup water over it, cover and cook for 5 minutes more. Serve with a cooling raita and a vegetable curry. I had never heard of this dish before nor have I tasted it.. This is a must try now! thank you, Anu for sharing this unique creation of yours..
Can I make this pulav with finger millet (Ragi) instead of Varai? Will that require any changes to the recipe? Shilpa: Yes. I will definitely upload a picture. Ashwini: I doubt this pulav will be good with ragi. You will find millets in the US for sure. Nice recipe. I like varai pulao – the recipe which features peanuts and chillies. Varai or barnyard millet is also called jungle rice or Samo, latter name being popular in the USA Indian stores. Great, informative read/post! And you cook this dish, spectacularly, ofcourse I can say that, because I've tasted it and the taste lingers! do you have any lasagne recipe which has instructions for makin lasagne sheets also ? A very good blog. I loved the colourful appearance of your blog.. And the way you have just explained even about the way we have to cut the vegetables is just very informative to make it look class… Thanks for such a good blog. I have to cook this recipe without making it too late. I will just order all the ingredients on an online supermarket and will implement your recipe. Thank you. Am going to try the recipe asap. One question. Doesn't cooking the dish after adding lime juice make it bitter? I made this for chaturthi fast so I did not add veggies , only add potato nd also add roasted crushed peanuts. It was so tasty. I never thought of making varai like this….gr8. I'm gonna try out this recipe for sure..haven't tasted yet..
Hi, I am assuming varai is what is called Sama or Saame millet in Kannada. I just made a creamy khichdi out of Sama and mung dal yesterday. 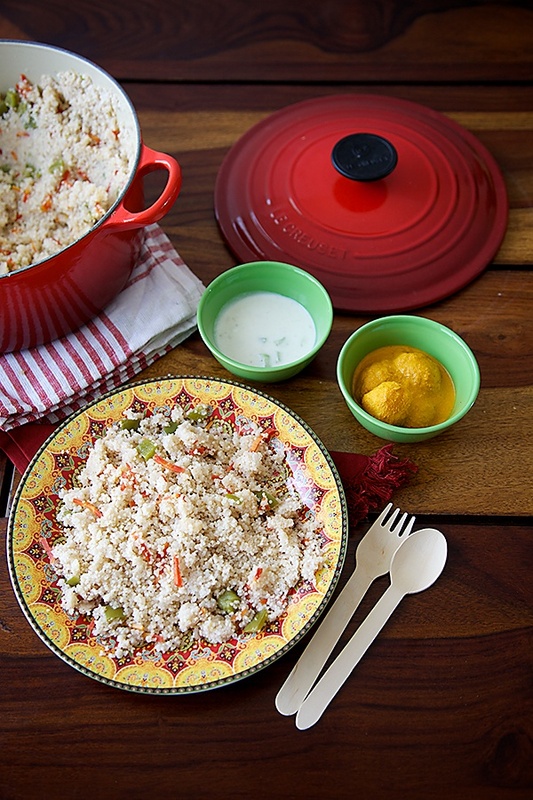 This pulao is a great idea! Will be trying this out soon. I do love millet and have used it to make pilafs, millet cakes etc. I do not think I have actually tried this with cabbage though so I am really liking this idea. What a gorgeous portrait. The recipe looks so tasty and beautiful! Hey its a good recipe which serves awesome hot and spicy.. But I had a query, is it wise to add jeera and turmeric too in this recipe?? Lovely. Varai takes a whole lot of water! I've tried making dosa with varai and grinding with tomatoes and few spices. It was yum! Hi Anushruti, Long time…No posts from your end…. After reading your recipe, I made a slight variation to it as vegetables are not allowed during our fasts. I just used boiled potatoes. For a tangy taste I used tamarind juice. Apart from it I used ginger, crushed roasted peanuts and some freshly grated coconut. It tasted awesome. You can add this variation specially for vrats & fast. The tamarind gives this recipe a tangy twist. Mrunmayi: Your variation sounds nice. Glad you enjoyed it. I came across your recipe while searching for a variation in varai recipe for Ekadashi. It looks delicious. Will try it out soon. Thanks. Shobha- Hope you like it. Kokila- Boiled rice or any other rice is not used during fasting across all Hindu cultures irrespective of language.